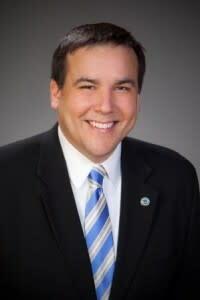 Columbus Mayor Andrew J. Ginther grew up on fields, diamonds and courts. “If you wanted to find me during the course of the year, go to the fields at the Park of Roses,” said Ginther, who grew up in the Clintonville section of the city. He played football, basketball, volleyball and baseball at Whetstone High, and football at Earlham College. Ginther: I had daddy duty and couldn’t go to the (NCAA Division I Women’s Volleyball Championship at Nationwide Arena). But I watched; I always love it when we’re on national TV and they find other places in our community and show them leading in and out of commercials: Bicentennial Park where we had the grand illuminations, Columbus Commons, Ohio State. GCSC: Who influenced you when you were a kid and playing all those different sports? Ginther: I played for “Cookie” Stevens on all those Clintonville Boys Association Teams. We were undefeated in baseball and basketball. He was a wonderful coach and I used to run into him every once in a while, he was a volunteer at the Columbus Museum of Art. He taught us to have fun and do things the right way, but he was a huge competitor and we won a lot. (Merrill Bigelow “Cookie” Stevens passed away in 2013; he had a long career as a coach and educator). GCSC: What was your best sport? Ginther: Probably football, although I became a decent volleyball player. Errole Rembert was my volleyball coach, a phenomenal coach. I was OK in basketball and baseball. I was too slow to play (football) at Ohio State and went to Earlham College. It’s Division III – no scholarships. It was a great experience and a lot of fun and I remember the coaches all told us on that first day: If you miss classes or labs, you won’t be playing. GCSC: When did you begin to understand the importance and impact of sports for the city? Ginther: When the Experience Columbus and the Sports Commissioned came out with the Destination Columbus plan (in 2012). They put together the research data and quantified how important tourism and sports and meetings and conventions were to the city and our economy. And, when you look at our greatest opportunities for growth, this is what came up over and over again. We have the right leadership in place with Brian (Ross, CEO of Experience Columbus) and Linda (Logan, Executive Director of the Sports Commission) … Linda has taken the Sports Commission and made it into one of the strongest sports commissions in the country. GCSC: I know this is an obvious question, but what does bringing sports events to Columbus do for the city? Ginther: As I was watching the (NCAA Division I Women’s Volleyball), I was thinking how all these people in Tacoma and Iowa City and San Diego are watching us on TV. We’re putting ourselves in people’s living rooms all over the country and the world, and that exposure is so important. And, then there’s the direct economic benefit of all the thousands and thousands of people who come here for all these events. And, for a place like Columbus, often times we need that one event for someone to come here for the first time and be wowed and say, ‘I’m coming back here; I’ll hold my event here.’ When they come here, they see everything we have: The affordability and accessibility and great facilities and amenities. They see all this momentum and all this interest in Columbus that comes from all these sports events. The NHL All-Star game (in 2015) and now the Blue Jackets are red hot, and the Crew SC have had such an impact, and all the big events at Ohio State. GCSC: I’ve heard you talk a few times about the Columbus Way, about how the city’s model is nationally known and they even teach it at the Harvard Business School. What is the Columbus Way? Ginther: The bottom line is that the public and private sectors understand the return on investment we get with Experience Columbus and the Sports Commission. We understand how to come together and we are used to coming together to pool our resources to meet our goals. So, it’s not unusual here, but other communities understand how unusual it is. It’s how we developed Columbus Commons and the riverfront. GCSC: What’s next? What other big events would you like to see come to Columbus? Ginther: We’ve gained a big reputation in volleyball and running, with the (USA Track & Field Half Marathon Championships) here in 2016 and again in 2017. Clearly we have the synergy and experience and exposure in these areas and I think there will be event more big events here. GCSC: What else do you see in the city’s future? Ginther: Basketball. The NCAA Women’s Final Four is here (in 2018) and we’ve become part of the men’s and women’s tournament rotation. and Regional Training Academy at 6 p.m. tonight.